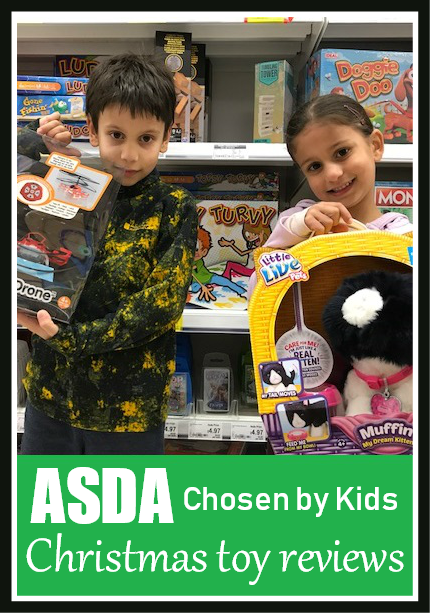 When it comes to choosing which Christmas toys to stock this year, instead of using traditional product buyers Asda has launched a whole new range of toys chosen entirely by children. The Chosen by Kids toys were selected after a toy testing event in Harrogate, and they are now available in stores in plenty of time for Christmas 2017. I was invited to take my children along to our local Asda store, Asda Ferring, to head to the toy aisle and see what they thought of the toys in the range. They also had the chance to take home their favourite toy to review. We headed over one evening after school, when I knew that it would be quieter so we could have a proper look around. The children were absolutely thrilled at the opportunity to choose their own toys, and very excited. We don't normally spend long browsing in the toy aisles, and there was plenty to choose from! Both children were first drawn to the toys that were from brand names that they recognised, like the Lego, Playdoh and toys based around their favourite television programmes. Harry spotted what he wanted almost immediately - he has been after a drone for a while having played with one at a friend's house. There are two in the range to choose from and he settled on the Little Tikes My First Drone. He chose a smaller one because he liked its appearance, and it didn't look too complicated. Mia spent a lot longer deliberating. She's instinctively drawn to anything pink, purple or fluffy, and there was plenty that appealed to her. When I spotted the Little Live Pets My Dream Kitten - Muffin on the shelf I knew that it would be perfect for her. I wasn't wrong, as soon as she saw Muffin the kitten she couldn't be parted from him, and she couldn't wait to get home and unpack him! We left the store with two excited children! Here is what Harry thought of the drone. Ratings are on a 1-5 scale, with 1 being poor and 5 being superb. Ease of use - 3. An adult is needed to put batteries in, but once that is done it's easy to get going. The drone charges from the controller pack, and although it did work straight away it performed better after it had been charged for a little while. The controller is easy to hold and has large buttons so it's simple for even young children to operate. The drone itself looks a little flimsy as it is very light, but it has stood up well so far. Harry didn't have any problems working out how to control it, but he did find that he couldn't get it to fly as high as he was hoping. Value for money - 3. I think that the price is reasonable. Fun factor - 3. The drone is designed for indoor use which Harry was very pleased with, especially at this time of year when he's not so keen on playing outside. This did mean however that it doesn't move very fast or high, and he sometimes struggled to keep it in the air for very long which frustrated him. Longevity - 3. It's a fun toy and I think it's something that he'll keep coming back to. Although it's supposed to be used indoors I think we'll be taking it out into the garden in the summer, it doesn't fly high or fast enough to worry about losing it over the fence. Aesthetics - 4. Harry loved how the drone looked, he really liked the bright colours and how it lit up in flight. It also makes fun noises. Here are Mia's views on her Dream Kitten. As above ratings are on a 1-5 scale, with 1 being poor and 5 being superb. Ease of use - 5. Once removed from the packaging and switched on, Muffin was all ready to go with no extra set up needed. Mia has used it a lot and we are still using the original batteries that it came with. Value for money - 4. It's perhaps a little pricey, although I do think that it's a fab toy for the money. Fun factor - 5. Mia absolutely loves Muffin. The kitten makes a variety of different noises and has sensors in different places, for example on his back and his cheeks, so you can elicit different responses by stroking and cuddling. There is also a little food bowl, and when you hold it to his mouth you can hear lapping sounds. He's a sleepy kitten, and Mia is thrilled when he decides that it's time for a nap, she's been making him up little beds with cushions and blankets. Longevity - 5. Mia has been playing with Muffin for a few days now and shows no signs of boredom. She does particularly love her stuffed animals anyway, so it's the perfect toy for her, and she has been incorporating him into her games beautifully. Even when he's turned off she's still happy to play with him. Aesthetics - 5. He's lovely and soft and also weighted nicely, so you can cuddle him and he does feel rather like a real kitten. He has a sweet little face and a lovely collar with a pendant to write his name. He also comes with an adoption certificate and a little promise to make saying that you'll look after him, which makes it all very special. He's not designed to be slept with but it was difficult to part them at bedtime, and I couldn't resist snapping a quick photo once she'd fallen asleep before moving him to a bed on the floor! This is a collaborative post in association with Asda.